New Delhi: Waseem Ahmed sits cross-legged behind a small wooden desk in his classroom at the Urdu Academy in Delhi, dips a small reed pen into an ink pot and writes an Urdu couplet in a smooth arc with practised ease. 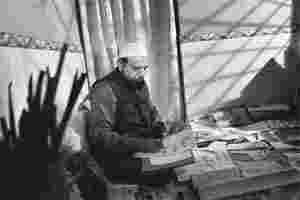 Wearing a beige woven skullcap and a matching Pathan suit, he examines the yellowed paper with the studious concentration of a monk reading a holy book. Ahmed is one of a dwindling number of Urdu calligraphers in the Capital. Born in a small town outside of Lucknow, Uttar Pradesh, he learned his craft in a small madrasa (Islamic school) in the state, where he was trained in Arabic, Urdu and Persian literature, language and writing. “I had a fascination for this since childhood," he says. “I decided to be a calligrapher after I saw a man making a poster. I thought it was very beautiful… and it seemed like a good career." The art of calligraphy in India dates back hundreds of years and is deeply intertwined with the country’s history. Influenced by Hindu, Jain and Persian styles, India’s many styles of Urdu calligraphy reached their zenith at the height of the Mughal empire, according to Khalid Alvi, an associate professor of Urdu literature at Zakir Hussain College in the University of Delhi. “Most of the great Mughal kings used to be calligraphers," he says. “Jahangir, Shah Jahan and Aurangzeb were all calligraphers—it was considered a skill like ghur savari (horse riding) and teer andaazi (archery)." Calligraphy can be found adorning many of India’s most famous monuments: intricate carvings of Quranic verses decorate the walls of Delhi’s Jama Masjid. Quranic verses influenced by the Persian style adorn the ceiling of the Taj Mahal. Kufic-style Arabic text—with flowers, wreaths and baskets influenced by Hindu and Jain traditions—embellish the walls of the Qutub Minar. “Even after independence, there were many calligraphers—some were very highly regarded," says Alvi. “At that time, all the Urdu books were written by calligraphers; all the Urdu dailies as well." Ahmed estimates he has transcribed more than 100 books into Urdu during his career, with people seeking his services from as far off as London and Pakistan. But with the introduction of an Urdu computer program, contracts for Urdu books have all but dried up. Ahmed views the transition from handwriting to computers through a pragmatic lens. “Everyone likes the handwritten art. If I were to give you one handwritten document, and one on the computer, even you would say you preferred (the handwritten one)," he says. “So, of course we have our preferences, but the computer has made our work easier. We used to make mistakes, which would take a lot of time to redo. On the computer, you are able to correct it by pressing just one button." But M. Ahrar Alam, a Jharkhand government official who has been practising Nastaliq calligraphy—a Persian-Arabic script—for nearly 30 years, says a computer programme can never replicate the artistic value of handwritten script. “This is a sacred art—the concept of unity of God, unity of Allah is represented in the script," he says. Alam, who writes under the pen name M. Ahrar Hindi, has given lectures on the religious significance of the art at universities in Bihar, Jharkhand and Delhi, and recently invited calligraphers from Tehran to India in an attempt to revitalize local interest in the craft. “I am trying to revive the appreciation of that traditional and sacred art that is calligraphy. It is there in Istanbul, in Cairo and in Tehran. But not in India—here there is no market." “Children who used to come earlier came with the intention to earn a living with this art," he says. “They would write for papers and earn some money. Nowadays kids don’t so this for a living; they do it because they are interested in the art." On a recent Tuesday, three women sat on the floor, cross-legged on a matt, tracing the dotted outlines of the Urdu alphabet with reed pens. These days his students range from homemakers and children to professionals—one of his students is a Supreme Court advocate, another an imam. In total, he has about 25 students under his tutelage. “I get all kinds of people—housewives, their daughters and nieces all come because they want to learn," he says. “Also, people who want the titles of the Quran to be written, they come as well; wedding cards and posters also form a part of our work." It is the passion to learn the art of calligraphy on the part of his students that gives Ahmed hope for the future of his craft. “The beauty of calligraphy is a great pleasure," he says, watching his students practise the graceful curves of the Urdu alphabet on yellow-lined paper. “We are just making sure this art is not lost. We are not doing a business here to earn our daily bread. This is an art we are creating."